A new blue and gold kiosk on the sidewalk between the School of Medicine and the Health Sciences Building will provide up-to-date information on university and city services. The kiosk is one of eight located on UMKC’s Health Sciences and Volker campuses. UMKC is the first university in the U.S. to install the CityPost digital kiosks. Resembling giant smart phones, the kiosks are similar to those along Kansas City’s streetcar route. The digital kiosks are part of a communication network that broadcasts real-time, location-based information and alerts to provide safer, better connected public digital solutions. Information is powered by 55-inch smart screens and a companion CityPost mobile application. UMKC CityPost, in partnership with Duke Energy, is a wholly owned subsidiary of Smart City Media LLC of New York, the same creator of the kiosks along the Kansas City streetcar line. As Kansas City’s university, UMKC was invited to be the first campus site in the U.S. for CityPost. No public or tuition dollars are used to fund the system. 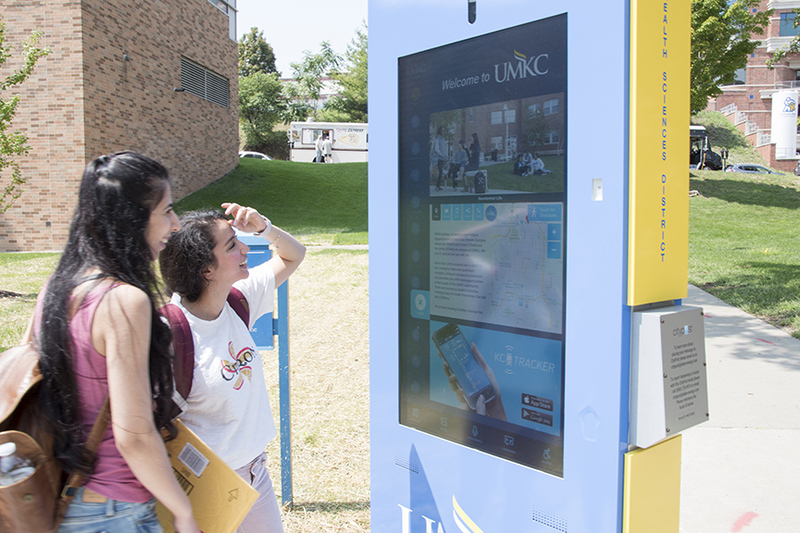 Using touch-screen technology on the 7-foot-tall UMKC CityPost blue-and-gold kiosks, visitors to campuses can learn more about student services, dining options, UMKC and KC events, where to discover art and whento enjoy sporting events throughout the city. The kiosks also include local news, bike-rental info, walking maps and a selfie app. Mentors make significant contributions to enhance and develop the careers of faculty and trainees through generosity, listening, objectivity, and constructive feedback regarding career and professional/personal development. In appreciation of those who have exhibited successful mentoring at the School of Medicine, the School is now taking nominations its first Excellence in Mentoring award. The award will be presented annually in two categories: Lifetime Achievement in Mentoring, for professors; and Excellence in Mentoring, for associate or assistant professors. Nominees must be School of Medicine faculty members for a minimum of five years. Both tenure track and non tenure track faculty are eligible. Recommendations for the award should reflect the extent to which the mentor has provided sponsorship, encouragement and support for your career and development, as well as for the career and development of other faculty, fellows, residents or students. Nominators may name one individual for each award, must include a narrative of how the individual’s mentoring has impacted their career and those of others, include specific outcome measures, and are encouraged to seek up to four additional letters of support. Nominees will be asked to a one to two-page narrative describing their mentoring philosophy and a list of individuals mentored. 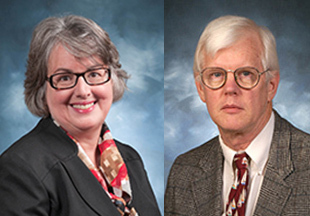 Awards consisting of plaques and monetary acknowledgements will be presented at the Dean’s Faculty Dinner on Jan. 29, 2014. Submissions are due no later than Nov. 15 to Dr. Rebecca Pauly, Chair, Selection Committee, at paulyr@umkc.edu. Download the Excellence in Mentoring Award document for more information on the award and guidelines. The UMKC Physician Leadership Program is now taking applications for an eight-month course designed to provide physicians with the management and leadership skills necessary to fufill the requirements of health care delivery in the 21st Century. The program offers advanced curriculum and expert faculty to provide physicians with skills and frameworks for innovation and strategic thinking, as well as financial and business acumen. The Physician Leadership Program begins September 26th and runs through April 2013. The 1120-contact hour certificate program is jointly sponsored and managed by the School of Medicine and the Bloch School of Management. For additional information about the program, view the web site at www.umkc.edu/plp or contact Eugene Fibuch, M.D. at efibuch@saint-lukes.org or Arif Ahmed, Ph.D., at ahmedar@umkc.edu. The Masters Degree in Health Professions Education provides an educational research foundation for teaching, assessment and leadership in health professions education. The new Master in Health Professions Education (MHPE) degree, a joint program offered through the UMKC School of Medicine and School of Education, is accepting applications. The program is geared to launch a new generation of expert teachers and curriculum specialists for schools of medicine, nursing, pharmacy, dentistry and for the allied health professions. The MHPE focuses on incorporating the latest medical research into curricula, the design and delivery of evidence-based educational programs and courses, program evaluation, the effective use of assessment tools, educational research in the health professions and leadership. Johns Hopkins, Vanderbilt and Baylor have similar programs. “The health professions community has clearly recognized the need to provide formal support for teaching and assessment and the master’s degree is supported as the most effective vehicle for doing this,” said Ellen Lavelle, Ph.D., Director of Health Professions Education. The 36 hour program may be completed in two years. All courses are project-based. Students develop projects that will reflect their current professional interests and impact teaching and learning in those areas. Two unique features of the MHPE are the Professional Educators Portfolio, which provides an opportunity to apply learning and showcase projects across courses, and the Summer Health Professions Mini-Conference, which is designed and delivered by students with the support of faculty. The program is open to all health professions and allied health faculty and students at UMKC. 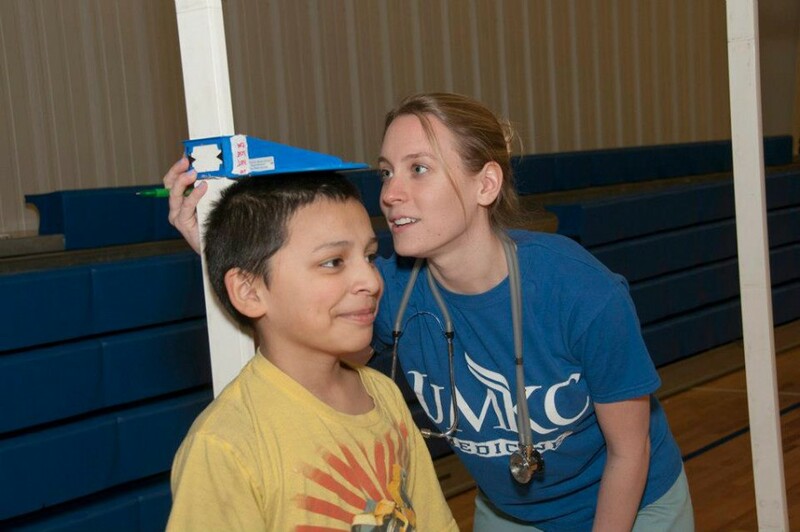 UMKC School of Medicine Students, residents and faculty provided free phyicals for about 400 students as part of the RBI program in cooperation with the Kansas City Gilrs and Boys Club. Hundreds of local school children will get a chance to play in organized sports leagues this summer, thanks to free physicals provided by students and faculty at the University of Missouri-Kansas City School of Medicine. Physicals are required in the Reviving Baseball in the Inner Cities (RBI) program at the Boys & Girls Clubs of Greater Kansas City, which provides boys and girls, ages 5 to 18, with the opportunity to play baseball and softball. “The students enjoyed interacting with the kids and parents,” said George Harris, M.D., professor of medicine and assistant dean for Years 1 and 2 Medicine, who is the faculty adviser for the program. Sports physicals usually cost a regular appointment at a doctor’s office, typically $50 or more. Sometimes sports physicals will be discounted to $10 through organizations. But free physicals are crucial for the success of the RBI program, said Ronald Stevenson, director of RBI in Kansas City. To play for a season costs only $25 per player, but that pays for uniforms, equipment, trophies, field maintenance and umpires. The RBI program, which has helped produce professional players, encourages college for each child. The interaction with UMKC School of Medicine students works as a bridge to that goal, and also reflects UMKC’s ongoing commitment to engagement with the urban community. UMKC students Kevin Gray, MS 5, Irene Israel, MS 3, Susamita Kesh, MS 2, Monica Mikkilineni, MS 5r, Felicia Ratnaraj, MS 5, Ty Smith, MS 5, David Testrake, MS 5, and Amanda Williams, MS 5, volunteered at the event. Residents Mary Hoang, M.D., and Chris Jenks, M.D., and family medicine faculty including Miranda Huffman, M.D., Crystal Jones, M.D., and Harris also worked. As part of the 2013 Black History Month celebration, the UMKC libraries will participate in the 24th National African American Read-In on Feb. 20 and Feb 28, recognizing African American literacy. 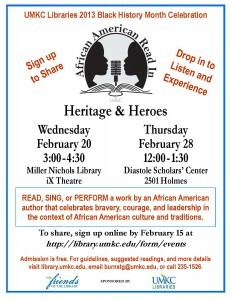 The programs will be 3-4:30 p.m. on Feb. 20 at the Miller Nichols Library iX Theater, and noon-1:30 p.m. on Feb. 28 at Diastole. Participants will present literature, music and other works from African American authors and artists. Admission is free to both sessions but participation is on a first-come, first serve basis. Presenters are encouraged to sign up for a time online at http://library.umkc.edu/form/events by Feb. 15. Anyone who would like to share but needs a suggestion for a book may check out the African American Read-In: Supplemental List for Young Adults and Adults. Black History Month exhibits will also be set up on the ground floor of Miller Nichols Library. Tracey Hughes at hughest@umkc.edu about the Diastole session. For more information about the Twenty-Fourth National African American Read-In: http://www.ncte.org/action/aari. The School of Medicine will offer a Faculty Developement Lecture with Michael Hosokawa, Ed.D., a professor in the Department of Family and Community Medicine at the University of Missouri School of Medicine, at 11 a.m. on Jan. 28, 2013 in Theater B.
Hosokawa is a scholar in faculty leadership development in primary care medicine. His lecture, “Learning With Socrates,” will focus on problem-based and inquiry-based learning. 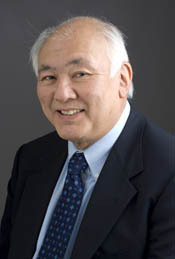 Hosokawa did his graduate study in health education and educational psychology at the University of Oregon. His primary research interests at the University of Missouri include medical education, inquiry-based learning and faculty development. Michael D. Jensen, M.D., ’79, discusses obesity and the behavior of fatty acids during the 2012 Mark Dodge Lectureship on Dec. 6 at the School of Medicine. Students, residents, faculty and staff learned about one of the most common and talked about problems in the country today – obesity – and the science behind it during the 35th annual Dr. Mark Dodge Lectureship on Dec. 6 at the School of Medicine. 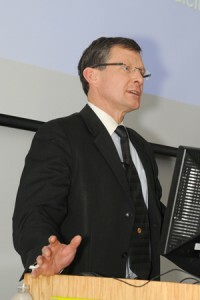 Michael D. Jensen, M.D., ’79, delivered the lecture after being introduced by Dodge’s daughter, Martha. His talk, titled “How Does Dysfunctional Adipose Tissue Cause the Metabolic Complications of Obesity?” focused on the effects of obesity and the behaviors of fatty acids. Jensen, who was named a Mayo Distinguished Investigator in 2012, is a consultant in the Division of Endocrinology, Diabetes, Metabolism and Nutrition at the Mayo Clinic in Rochester, Minn. He is also director of the Mayo Clinic’s Department of Medicine Obesity Treatment Research Program and a professor of medicine. After graduating from the UMKC SOM, Jensen completed residencies in internal medicine at Saint Luke’s Hospital and the Mayo Graduate School of Medicine and was a W. L. Stevenson Fellow in Clinical Nutrition at the Mayo Graduate School of Medicine. His research includes looking at the effects of upper verses lower body fat and the effect each has on one’s health, visceral health being the most detrimental. “When things start going wrong with fat, things go wrong with all the other tissues,” he said. Jensen shared his experiences with patients and through research to illustrate the importance of education about obesity. 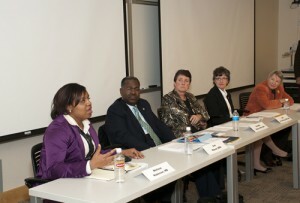 The internal UMKC health sciences panel consisted of (from left to right) Susan Kimble, D.P., P.N. D.P., R.N., A.N.P.-B.C., Pam Overman, Ed.D., Stefanie Ellison, M.D., Jennifer Santee, Pharm.D., and Jolene Lynn, Ph.D(c), R.N. Doctors, nurses, pharmacists and dentists collaborate to treat a patient. Doesn’t it make sense for collaboration to be part of their education as well? That’s the idea behind interprofessional education (IPE), an emerging priority in the education of health care professionals. The external included (from left to right) Melissa J. Robinson, M.B.A., Leo Rouse, D.D.S., Lucinda Maine, Ph.D., R.Ph., Jane Kirschling, D.N.S., R.N., F.A.A.N., and Carol Aschenbrener, M.D. The panel agreed that bringing health professional schools together to learn has many dimensions, but four critical components: leadership support, managing change, establishing and maintaining trust, and being honest. “Change happens at the speed of trust,” was the quote by Gary Gunderson that Maine used in describing how quickly IPE is implemented. Susan J. Kimble, D.P., R.N., A.N.P.-B.C., clinical associate Professor and MSN and DNP program director, UMKC School of Nursing. Pam Overman, Ed.D., professor and associate dean for academic affairs, School of Dentistry. Jennifer Santee, Pharm.D., clinical associate professor, Division of Pharmacy Practice and Administrations, School of Pharmacy. 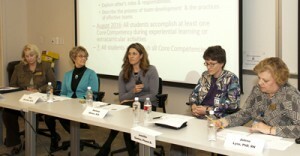 This panel reported on the collaboration toward IPE experiences at UMKC. They have been meeting quarterly for the past year and attended the IPEC Institute last year where core competencies for interprofessional education were discussed. The internal panel also acknowledged this was a large task. In order to make progress, they plan to start small with things the schools were already doing, expand those and persist so they could begin implementing IPE experiences at UMKC.